Marlon Brando, Jr. was an American actor who performed for over half a century. He is considered by many critics to be the greatest actor in motion picture history. He was best known for his roles as Stanley Kowalski in A Streetcar Named Desire and his Academy Award�winning performance as Terry Malloy in On the Waterfront, both directed by Elia Kazan in the early 1950s. In middle age, his well-known roles include his Academy Award�winning performance as Vito Corleone in The Godfather, Colonel Walter Kurtz in Apocalypse Now, both directed by Francis Ford Coppola and an Academy Award�nominated performance as Paul in Last Tango in Paris. 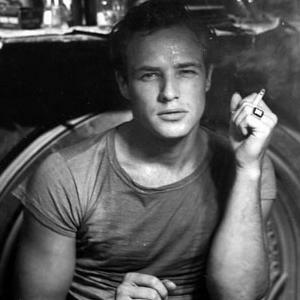 Brando had a significant impact on film acting. He was the foremost example of the "method" acting style, and was initially parodied for his "mumbling" diction, but his mercurial performances were highly regarded. Director Martin Scorsese said of him, "He is the marker. There's 'before Brando' and 'after Brando'.'" Actor Jack Nicholson once said, "When Marlon dies, everybody moves up one." Brando was also an activist, supporting many issues, notably the American Civil Rights and various American Indian Movements. Elvis Presley had nothing to do with excellence, just myth.